Kick the mayonnaise to the curb for this sandwich. 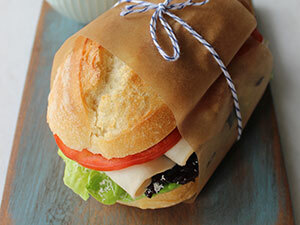 Chef Samuel demonstrates how to elevate a plain turkey sandwich with a condiment made with in-season blueberries. The scratch-made blueberry chutney is spiked with grated orange peel, ginger, crushed red pepper and cranberry sauce—flavors that pair especially well with turkey. 1. For blueberry chutney: In medium saucepan over medium-high heat, combine blueberries, cranberry sauce, sugar, balsamic vinegar, orange peel, ginger, red pepper and ¼ teaspoon black pepper; bring to a boil. Boil, uncovered, stirring frequently. for 15 to 20 minutes until slightly thickened. Pour mixture into clean jars. Cover and refrigerate up to 3 weeks or place in covered plastic containers and freeze. 2. To assemble, split bread in half lengthwise and place on work surface. 3. Mix mayonnaise with mustard, tarragon, salt and remaining ¼ teaspoon pepper. Spread mixture on both sides of bread. Place lettuce leaves on top; spread with blueberry chutney and top with grated cheese. Arrange sliced turkey evenly over cheese and top with sliced tomato. Cover with top piece of bread and serve.